Communication is quite simply "the exchanging of information", and we typically think of that in terms of language, but in reality, communication can look like many things. For my son, Brennen, it may be using a communication device. It may be eye contact. It may be kicking his legs with excitement, or the way he purses his lips when he is curious about something. These are all ways that he gets his message across, but it's not always easy. Communicating with a non-verbal child can be difficult. We naturally rely so much on verbal communication, but since Brennen can't talk, it is challenging. As accustomed as I am to picking up on his cues, there are times when I just don't know what he wants. I don't know what is wrong, or what he needs, and I don't know what to do. I think about how important words are to me, not only to get my needs met, but to express how I feel. Being able to express myself is something I (like most of us) take for granted, but we really shouldn't. Just imagine how different life would be without any words! It was determined early on that Brennen has "complex communication needs". We have tried a number of different methods of communication with him over the years, from speech-generating devices, technical aids and assistive technologies, all with varied levels of success. 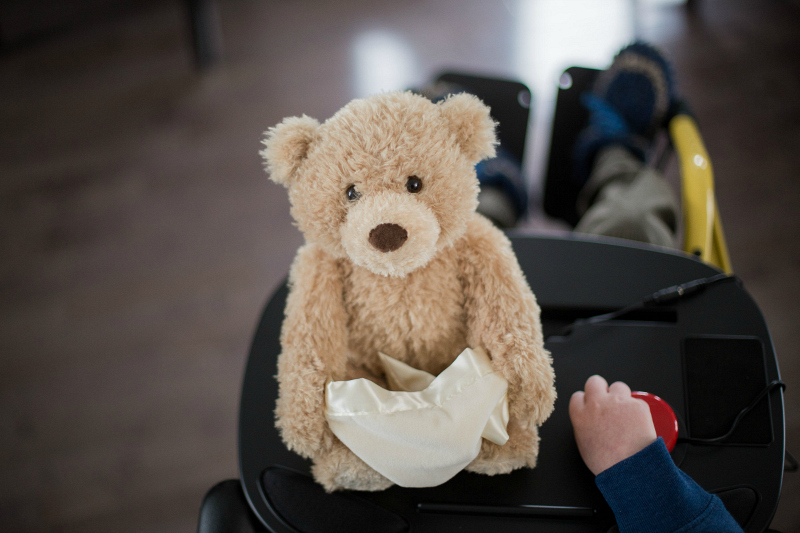 Assistive Technology is used to provide new opportunities for children with disabilities to interact with and control their environment. 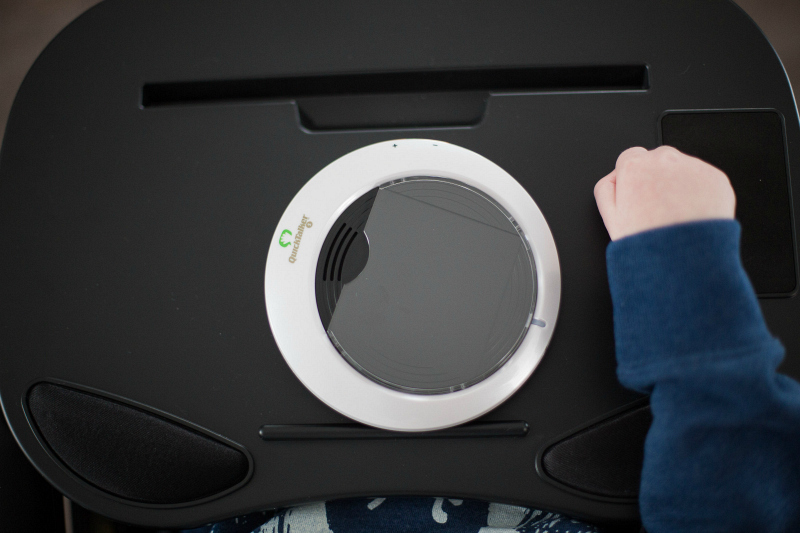 It can include things like special keyboards, touchpads, picture boards, switches, and eye-gaze software. We have had a fair amount of success with the switches that we've tried. There are many uses for switch devices, but it takes a bit of trial and error at first to determine what is the best type of switch for your child. When an appropriate switch is selected, it will provide access to opportunities that would previously have been unavailable. 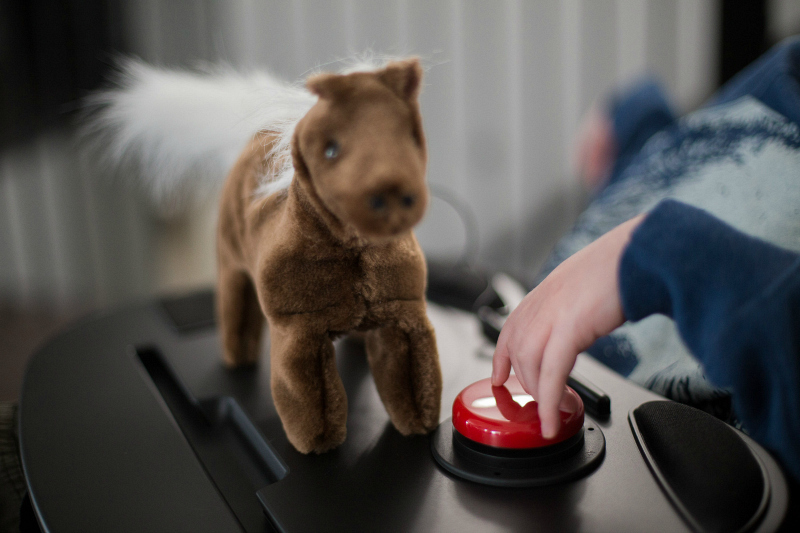 The use of a switch can enable a child to turn something on or off, communicate, and even play with cause and effect toys. AbleNet is the global leader in switch technology. "Since 1985, assistive technology from AbleNet has helped hundreds of thousands of individuals with disabilities around the world live productive and fulfilling lives. 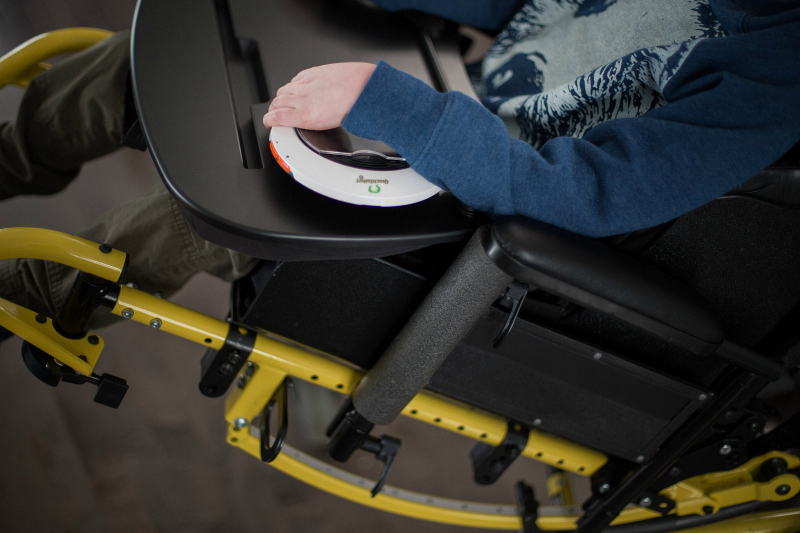 On a daily basis this amazing, high-quality assistive technology stands the test of time and provides an alternative method of access to communication, learning, leisure activities, and living independently. 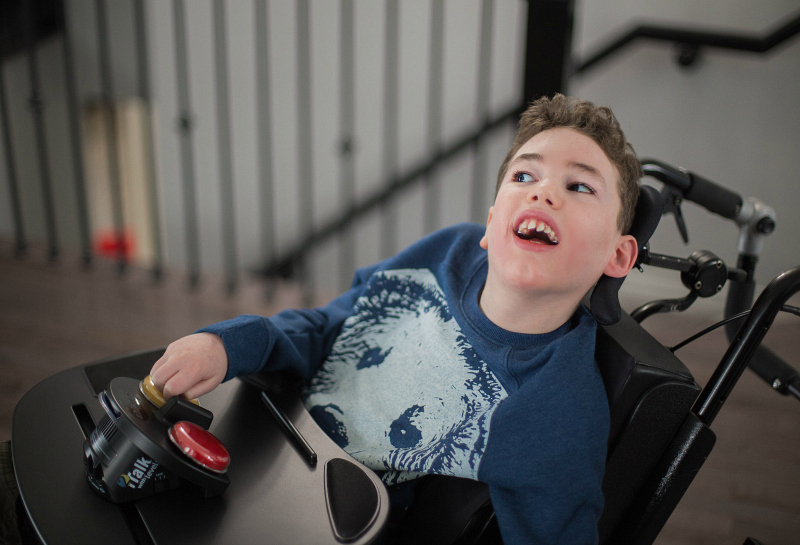 Whether it be one solution or a combination of solutions used at one time, we are confident that our assistive technology can help an individual in achieving their goals, gaining independence, and growing as an individual." The Jelly Bean Twist is the most common type of switch. It is a direct access, simple switch that is easy to see and easy to activate. The switch tops can be removed and replaced in one of four different colours (all are included with the switch). Activation is by pressure anywhere on the surface area, including the sides. 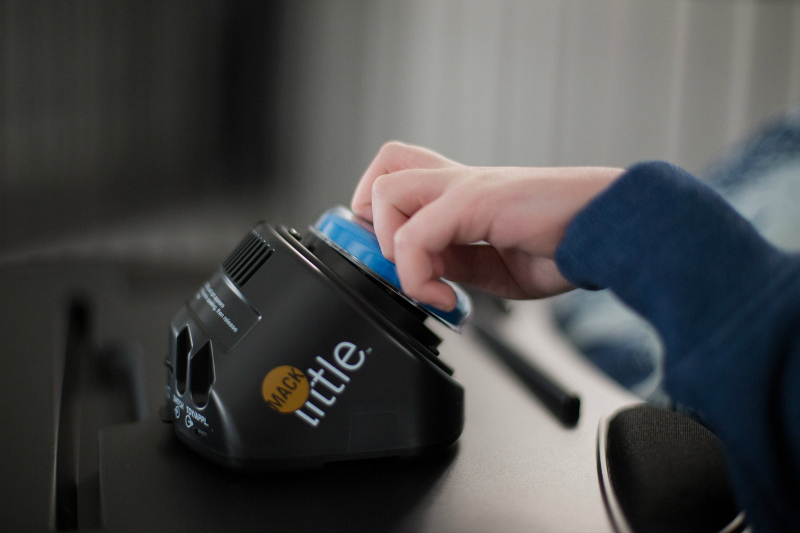 The Little Mack is probably the most popular single message speech generating device. It allows you to record one message, up to two minutes long, for easy playback. We use this one to send a message in to school with Brennen, with something like, "Hi guys, I had a really great weekend! I did this and this and this.."
TalkingBrix are another example of a simple-to-use, compact, speech generating device. 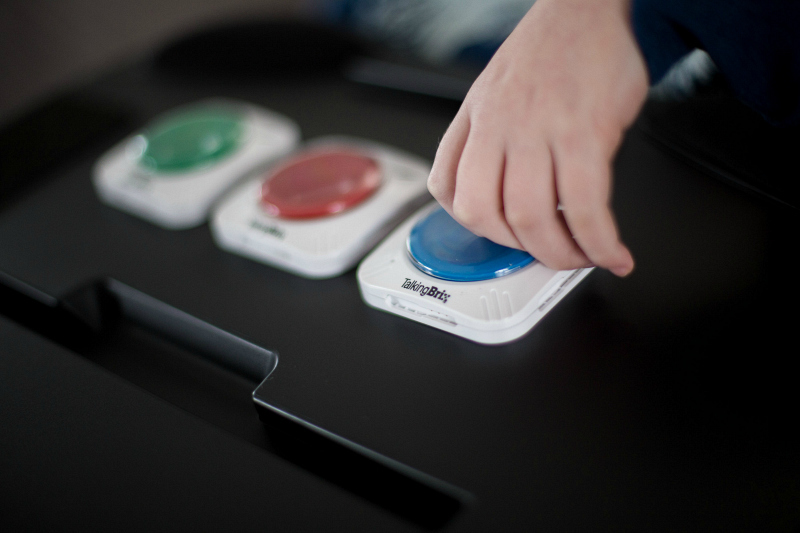 Each button allows 10 seconds of record time that can be used individually, or can be connected together to form a multi-message system. These are also magnetic, and can be stuck on different surfaces. 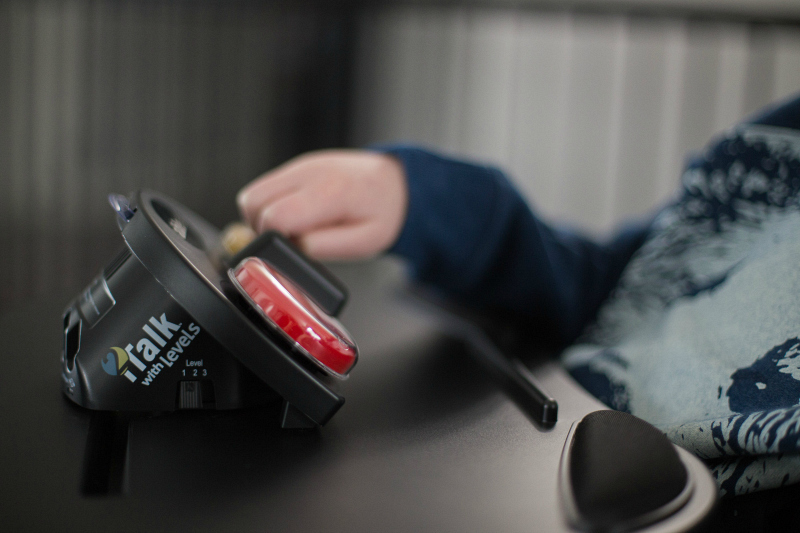 iTalk2 with Levels allows you to record two messages, with 4 minutes of record time. 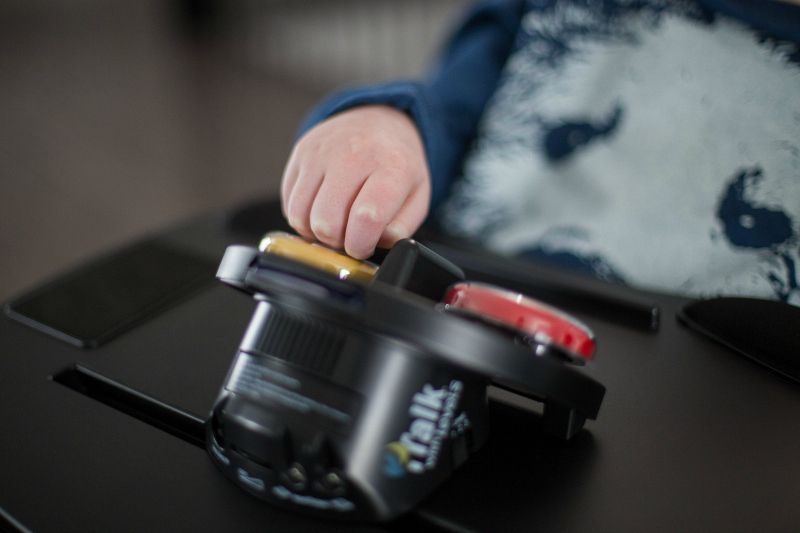 The Quicktalker S is probably our favourite of the speech generating devices. It is so easy to use! You can record a series of messages, then playback each recorded message by just waving a hand over the surface! It's great for anyone who has trouble hitting the button on a switch, or pushing down hard enough to activate it. We really love this one! 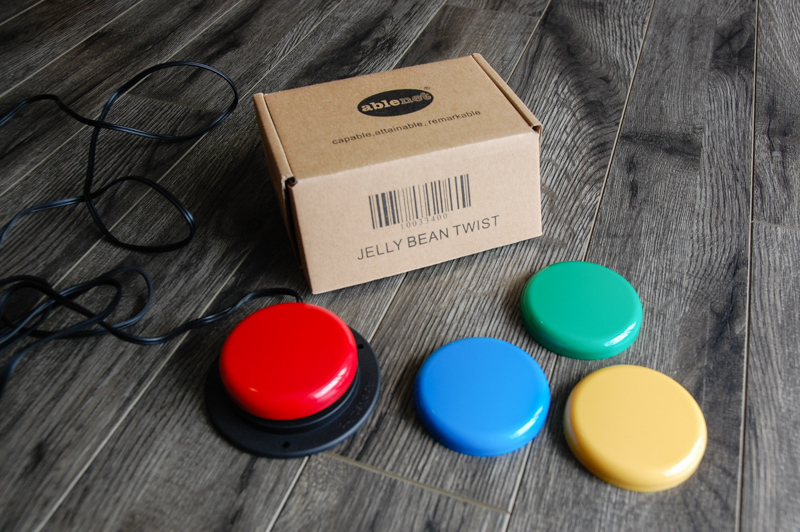 We have a number of switch adapted toys that Brennen can activate with his Jelly Bean switch. The Pony Pal and Peek-A-Boo Bear from AbleNet come pre-adapted for switch use! Pony Pal is a soft and cuddly toy that leaps, moves its head, "neighs", and wags its tail when the switch is activated. Peek-A-Boo Bear is an animated toy that has six different phrases and hides behind a blanket, playing an interactive game of peek-a-boo. For best results, your child should have easy access to the switch and be able to observe the resulting movement of the toy. "Brennen was quite responsive in the session today and smiled appropriately in response to many of my questions. Increased response rate was also observed." "Brennen was quite consistent in activating cause/effect software by pressing his Jelly Bean switch when positioned at a 90 degree angle to his arm rest." "Brennen has been successful in activating a single message VOCA to 'fill in the blanks' to songs and stories, and for requests." 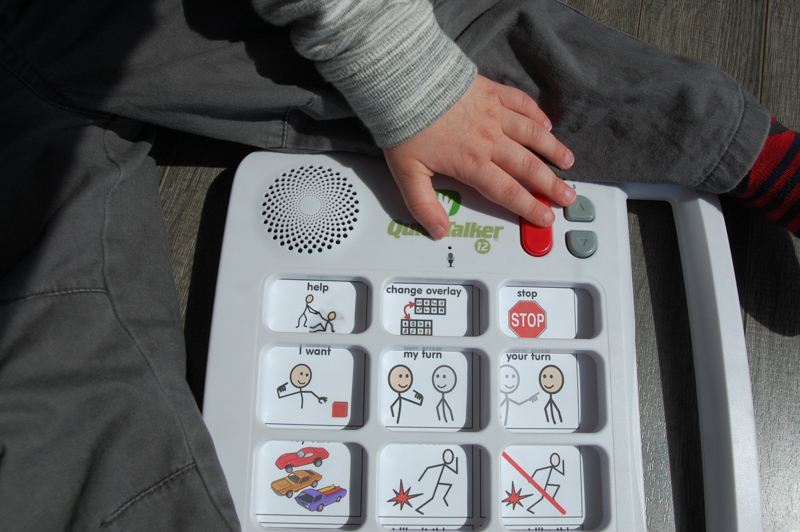 These are some of the things that we continue to work on with Brennen, doing everything we can to help enhance his communication and expand his world. 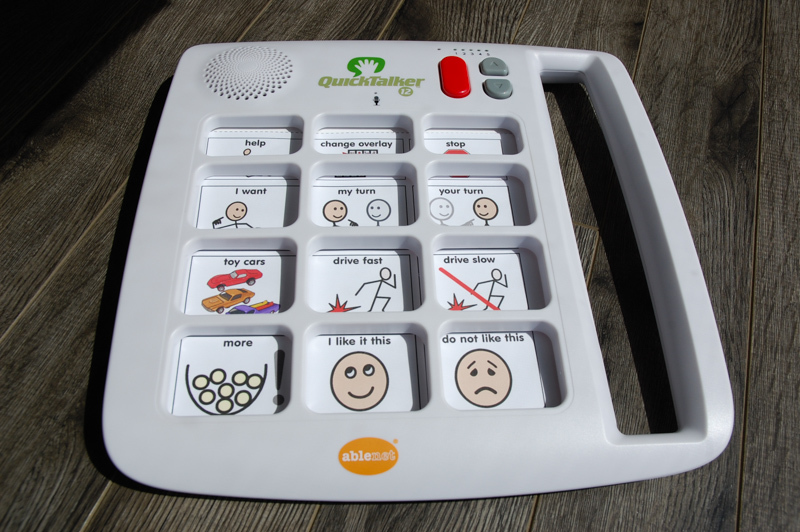 We also have the QuickTalker 12, which is a little bit beyond Brennen's level right now, but it has been very effective for some of the children that we work with! The QuickTalker 12 features twelve message locations, and the ability to provide up to 48 messages. It is a powerful and portable communication tool. The QuickTalker also comes in 7 and 23, allowing you to customize the message options for each individual learner. 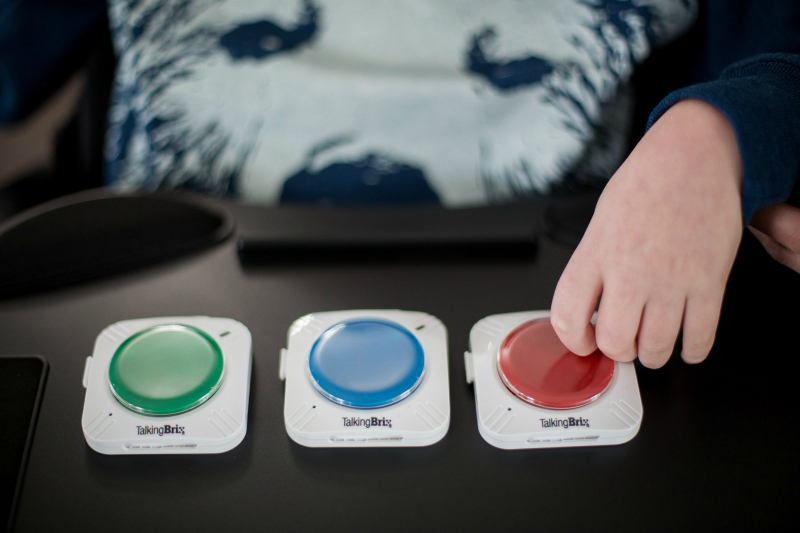 Without question, technology can improve the lives of individuals with disabilities and communication impairments, and AbleNet is committed to providing assistive technology solutions to help individuals with disabilities lead productive and fulfilling lives. "We believe that all people deserve the tools to help them learn about, interact with, and participate in the world around them. Whether that’s a child in the classroom, an adult recovering from an injury, a veteran with a permanent disability, or a senior who wants to remain at home, AbleNet is there helping improve their lives."